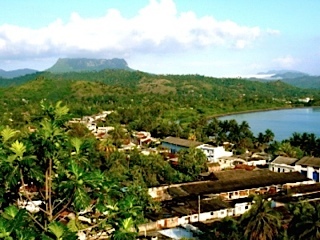 Baracoa is the oldest settlement in Cuba. Located on the extreme north eastern tip of the island, it is said to be the location where Christopher Columbus first set foot on this Caribbean island. In January 2003 the dream of the Baracoa Archaeological Society – to shed light on the unknown treasures of Baracoa and to preserve and share these treasures with the public – became a reality. The Archaeological Society, under the direction of Lic. Roberto Orduñez Fernández, a distinguished Cuban archaeologist and native of Baracoa, consists of about 15 professional archaeologists, geologists, speleologists and enthusiasts. The Cave Museum is located in a group of post-Pliocene, Phreatic caves located in El Paraiso, a neighborhood on the southern hill of Baracoa, east of the El Castillo Hotel (beyond the Ranchón). The hillside faces north and overlooks the city, the bay, and in the distance, the Majayara Penninsula. The site was approved by the Ministry of Science, Technology and Environment (Ciencia, Tecnología y Medio Ambiente, CITMA), represented in Baracoa by Lic. Ricardo Suárez Bustamante, for the creation of The Archaeological Museum of Baracoa”La Cueva del Paraiso” . Over 1,000 artifacts hitherto unseen by the public are on display. These include petroglyph tools, statues, ceramics, jewelry, engravings and a pre-Colombian burial site. Access to the museum is from an upper level, down a spiral staircase into an L-shaped cave of about 120 m². Egress is from the lower level. Set inside the walls of the cave are 25 glass display cases. Three larger glass cabinets occupy the center floor space. The display cases were provided by CITMA. Lighting inside the cave is provided by 25 ground lights and indirect lighting within the peripheral displays. Five exterior lights illuminate the exterior grounds. The lighting was provided by a Spanish amateur archeologist and friend of Baracoa.